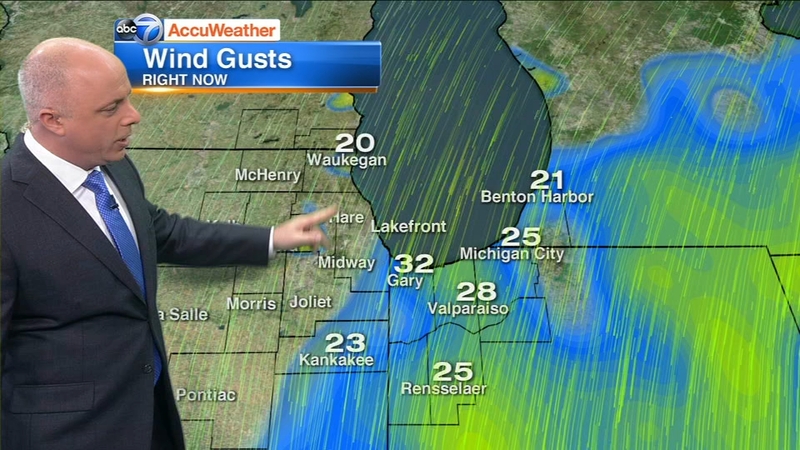 CHICAGO (WLS) -- The Chicago area is bracing for the biggest snowstorm of the season starting Thursday night. A Winter Storm Warning is set to go into effect at 6 p.m. Thursday for most of the Chicago area. The warning is in effect for Cook, DuPage, Lake, Will, Boone, De Kalb, Grundy, Kane, Kendall, La Salle, Lee, McHenry, Ogle and Winnebago counties in Illinois and Lake and Porter counties in Indiana and Kenosha County in Wisconsin until 9 p.m. Friday. The warning is in effect for Elkhart, La Porte, Lagrange, St. Joseph and Steuben counties in Indiana from 8 p.m. Thursday until 11 p.m. Friday. All Chicago Public Schools are closed on Friday, Feb. 9, due to the anticipated snowfall. For families in need of youth programs and services on the snow day, all Chicago Public Library and Chicago Park District facilities will be open during their normal hours. Families should check the hours, which vary, of their local facilities online or by calling the specific library or park. It could be the perfect day for a dip in the pool at the Kroc Center in West Pullman. "We've geared up for tomorrow to have a few extra activities," said Major Marc Johnson, Salvation Arm. Kids can get a day pass for $8, just come with a parent to use the sprawling facility and stay warm inside. "Our first goal is to get our doors open with our own staff here, if it's really bad. But once that happens, we've got several things that the kids can do," Johnson said. Dozens of schools across the Chicago area announced they were closing Friday. Other municipalities also opted to shut down their school districts in full. Click below for a full list of school closings. Northern Illinois University canceled classes at all NIU facilities and all university offices at all locations are closed. The open house for transfer students is also canceled, the university said. Snow began falling Thursday evening and will continue through the night. Anywhere between 6 and 10 inches of snow will be on the ground in the Chicago area by 8 a.m. Friday morning. Snow will fall throughout the day Friday, with additional accumulation of 3 to 6 inches possible. More snow is then on the way Saturday. Areas north could see anywhere from 1 to 3 inches from that storm, while areas south could see an additional 3 to 6 inches. The snow is likely to come Saturday afternoon into Saturday night. Residents are reminded that they are responsible for sidewalk snow removal outside of their property. Click here for Chicago's sidewalk clearing rules. The city of Chicago deployed more than 200 snow plows Thursday night. "Chicago's used to this on the other hand we haven't had a snow on this level. And it's not just one night, it's going to go through the weekend," said Mayor Rahm Emanuel. The Illinois Department of Transportation and Indiana Department of Transportation deployed fleets of snow plows and salt trucks to the roads Thursday night. "Our trucks are going to be caught in traffic just as everybody is if people decide to drive tomorrow," said IDOT spokesman Guy Tridgell. The Chicago Transit Authority said it anticipates providing normal service on Friday and is working closely with the Office of Emergency Management and Communications. Still, the CTA advised commuters to allow for extra travel time in the weather. Transportation officials are urging people who don't need to be out on Friday to stay home. Cold and snow can make it very difficult for vehicles, including buses and trains. The CTA said it uses a lot of extra equipment to make sure the trains keep running, including sleet scrapers. Trains are also equipped with snow plow blades and de-icers for the third rail. Buses are also equipped with engine warmers to keep them running smoothly. Metra BNSF trains will be running on an alternate snow schedule Friday. Click here to see the schedule. Metra is staffing key switch locations to keep them free of snow, and putting extra mechanics in the field. It's also pre-fueling locomotives and leaving engines on overnight. "We're so fortunate to have the robust transit system we have. Tomorrow's the day to rely on it. But there may be some delays," said RTA spokesperson Susan Massel. Pace is also asking passengers to avoid nonessential travel Friday. They advise their fixed route and ADA paratransit service passengers to postpone or cancel nonessential trips starting Thursday night through Sunday. Passengers should expect significant delays. Click here for more information from the Pace website. Chicagoans stocked up on food, water, and snowblowers as they prepared for heavy snowfall Thursday and Friday. Across the area, residents crowded grocery and hardware stores Thursday, stocking up on staples before the snow moves in. "Soda, coffee, bread, maybe TV dinners, pork chops," shopper Ziggy Anderson listed. The rush began when the doors opened Thursday morning. "It is very important because I am older, especially, to get out and get all of my shopping needs done," said Jeannie Bunnell, shopping at the Wrigleyville Jewel Osco. I came in Thursday to do my shopping, instead of Friday, because of the storm so I won't be caught in it tomorrow," said Richard Showers, shopping at the Wrigleyville Jewel Osco. The store's manager said home delivery orders doubled Thursday. "They heard about the weather, and it does impat our business. It is good for business," Paul Szyszka, manager, said. A similar scene played out at Clark Devon Hardware. Customers shopped for snow blowers and shovels, getting ready for snow removal. "Usually it is kind of slower in the winter time, but of course when there's snow that really brings everything out," said store manager Geremiah Somerville. The store is fully stocked with shovels, snow blowers and winter weather gear, but salt is in short supply. They're expecting another shipment Friday. "We did have to limit certain quantities, like normally we sell like palettes. We had to limit so there was at least enough for people to get themselves going," Somerville said. Chicago area commuters are trying to figure out if they can work from home Friday. Parking restrictions have been put in place across the Chicago area in anticipation of the storm. In west suburban Elmhurst reminded residents not to park on city streets for eight hours following a snowfall of 2 inches or more. No overnight street parking is allowed on Thursday or Friday. Officials in Gary, Ind., reminded residents to obey all signs designating no parking on city streets when snowfall is at or above 2 inches. Gary police said vehicle towing will be strictly enforced on designated snow routes. Residents who live on the 5th Avenue corridor near Horace Mann High School are being permitted to park in the school parking lot from Friday until Monday to avoid being towed, Gary officials said. Residents who live near Indiana University Northwest may also park in either of the school's parking lots from Friday to Monday as well. Officials in west suburban Aurora said it will enforce its snowfall ordinance, which prohibits parking on city streets and alleyways during or after a snowfall of two inches or more until the street has been fully plowed. The city said since Jan. 1, almost 600 tickets have been issued and 79 vehicles have been towed for violating the snowfall ordinance. Chicago fire officials are also reminding residents that if snow has piled up tall enough to cover your tailpipe, you should be sure to clear the snow entirely from around your tailpipe before starting your car to warm it up. If you do not clear the snow, you are at risk for carbon monoxide poisoning. For the motorists who simply have to hit the road Thursday night and Friday, some seasoned Chicago winter drivers have some tips. Number one: Head to the pumps. "Just do what you can prepare, obviously gas up," Cruz said. A full tank of gas was the number one goal for the drivers ABC7 talked to. "I usually make sure I put my shovel in the trunk of my car at all times. I tend to get snowed in a lot or get stuck in the snow so I keep my shovel with me and that usually gets me out," said Cruz. "I keep the hot hands and stuff in there in case we break down it'll keep the hands warm." said Chicago driver Shawn Mills. And number three: At least try to stay positive. "I don't mind the snow. You're in Chicago, you knew when you came here, you knew it was here before you got here," said Chicago driver Jeff Dore. If you've got a flight coming up, delays and cancellations might be in your future. Airlines flying out of O'Hare and Midway are asking customers to keep a close eye on their reservations. As of 9 p.m., O'Hare had 193 flight cancellations and Midway had 74 flight cancellations. Both airports reported average delays of less than 15 minutes. American Airlines announced Thursday afternoon that they have proactively cancelled 160 flights scheduled for Thursday and Friday, a spokesperson said. The airline is offering a weather waiver to allow passengers to change their flights without penalty. Flychicago.com has a complete list of carriers and their contact information. ABC7 will be going on the air Friday morning starting at 4 a.m.